When it comes to customer service, millennials have little patience and incredibly high expectations. In the United States, this segment's buying power will surpass that of any other single generation in 2017. Are you ready to meet these demands? 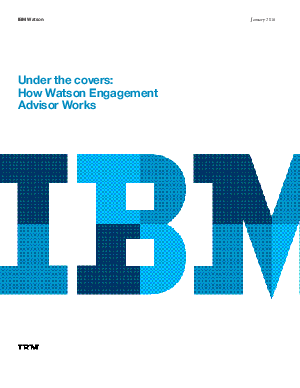 IBM Watson Engagement Advisor goes far beyond the conventional call center automation mandate of controlling operational costs - it empowers customers to serve themselves however and whenever suits them best. Whether it's troubleshooting their account, getting advice on which products to buy, or resetting their password, Watson Engagement Advisor is available 24x7 through any device to get to the heart of customers’ needs, faster.